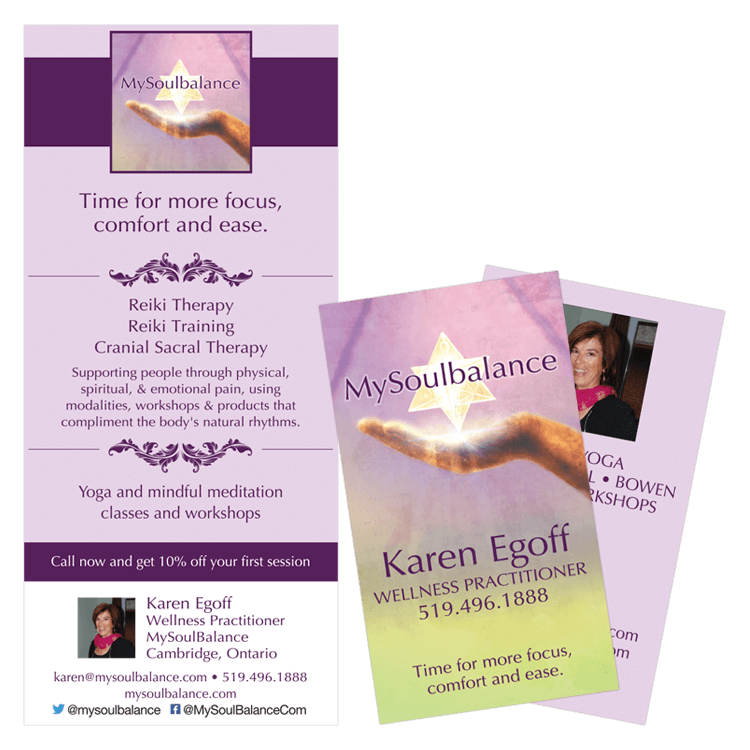 The client, MySoulbalance, is a local wellness practitioner who performs Reiki and Cranial Sacral in additon to leading yoga and meditation classes and workshops. The client had been unhappy with her previous marketing materials – she felt that the colours that had been used previously were too heavy and not representative of her current business. She required both a business card and a shelf blade that would attract her (mostly older) audience, and that would communicate who she was and what her business was. After experimenting with different colour combinations, we moved forward with a lighter purple colour that was harmonious and that evoked the serenity that the scent of lavender brings. The type was brought to a larger size, with more contrast to make reading much easier, and the text in the shelf blade was brought down to the bare minimum to help communicate the most important ideas about the client’s businesses as quickly as possible.